At Kyros house, Sabo plans on leaving as CP zero is heading towards Dressrosa. He tell’s the Strawhats that they should leave as Dressrosa will become hectic in a few days. They are surprised that Luffy has another brother. He tells them that Luffy was surprised, due to the fact that “he was dead the entire time”. Sabo reveals the events from his childhood with Luffy and Ace. While he was drowning at sea he was saved by Dragon. After being treated for his injuries, he awakens without any memories. When they decided to call his parents, he panics and asks them to “take him anywhere”. He tell’s Zoro that he eventually remembered who Ace was, he collapses for three days. 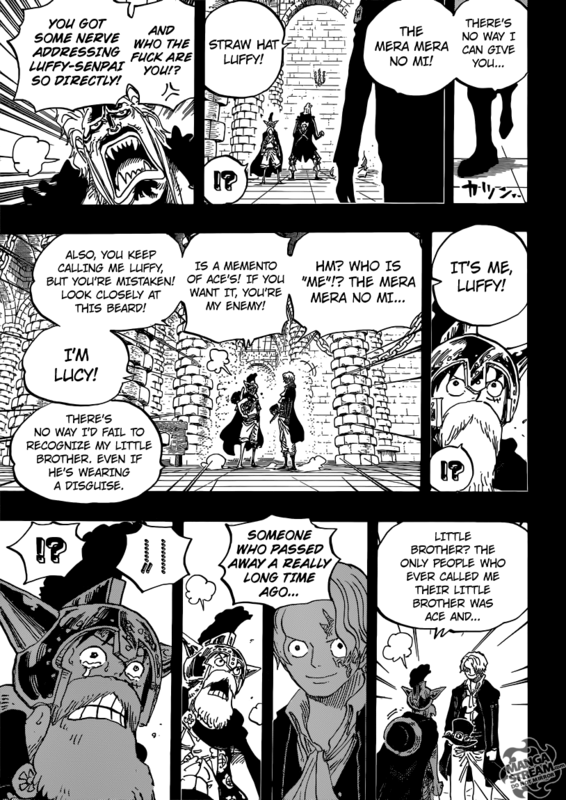 Two years later, Sabo enters the Colosseum and when Luffy recognized him. Luffy embraced Sabo as he expressed “his relief that Luffy was still alive as well”. 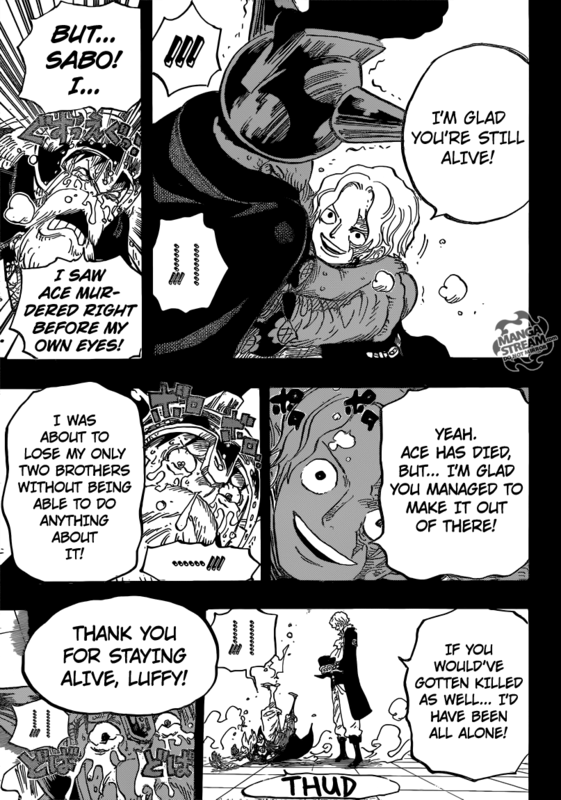 Luffy said that “he failed to save Ace and watched him die before him”, but Sabo said “that he is thankful Luffy did not die in Marineford as well”. Sabo then asked Luffy if “it would be okay for him to eat the Mera Mera no Mi, which Luffy gladly says yes”. Sabo prepares to leave, and gives a Vivre Card he made of Luffy to Zoro. Sabo leaves, saying “he is leaving Luffy in their hands”. Zoro remembers how “Ace said almost the exact same thing”. 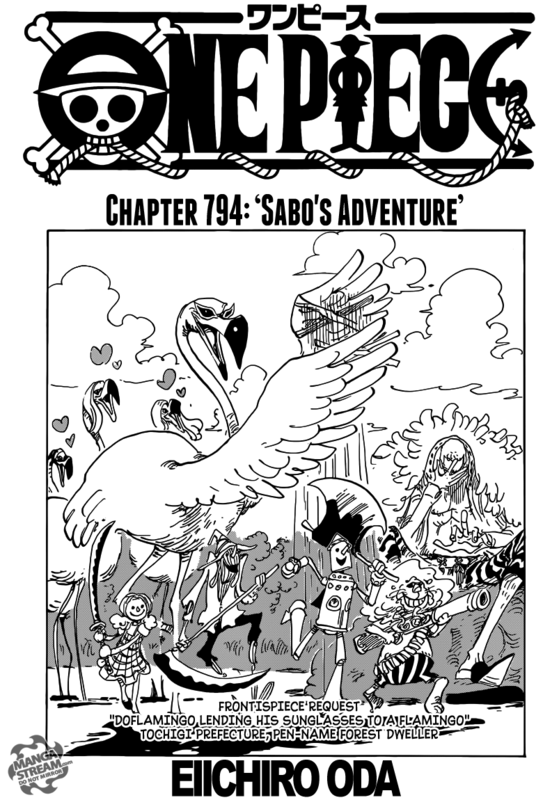 Sabo then rides away on a flock of birds towards the harbor. Liltotto realizes Bazz-B has been easily defeated as she stands defeated next to Giselle. She states that the two of them “could not even put a scratch on Yhwach”. Yhwach returns to his throne, returning to his slumber. Gerard searches for someone to fight, but reaches a dead end. Ichigo’s group can’t find Grimmjow and Askin and split up to search for them. Askin watches as he hides, but when Grimmjow confronts him Askin throws a ball of poison him at him. Grimmjow comes into contact with the ball and collapses. Several Shinigami race down a street, Lille then shoots Hisagi, claiming that he was the weak link. Meanwhile, Kenpachi, Mayuri, and Nemu come across Pernida. 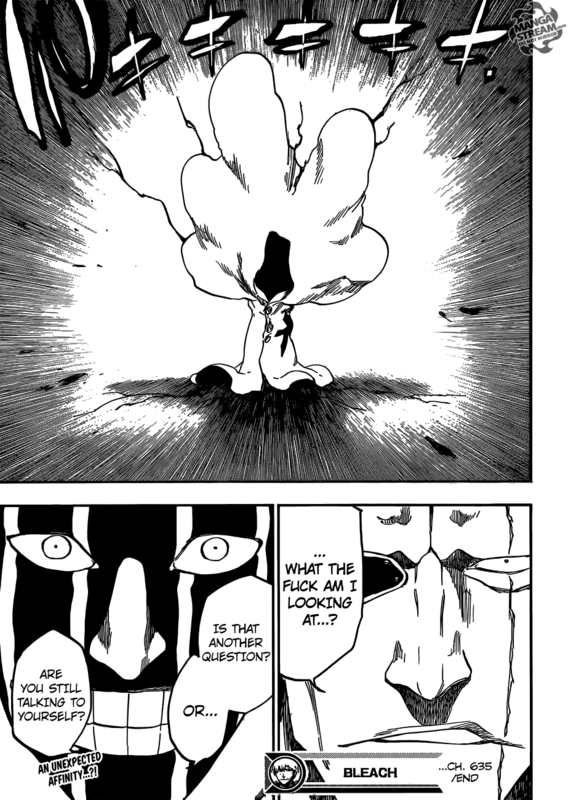 Kenpachi decides to kill it and attacks without listening to Mayuri’s warnings. 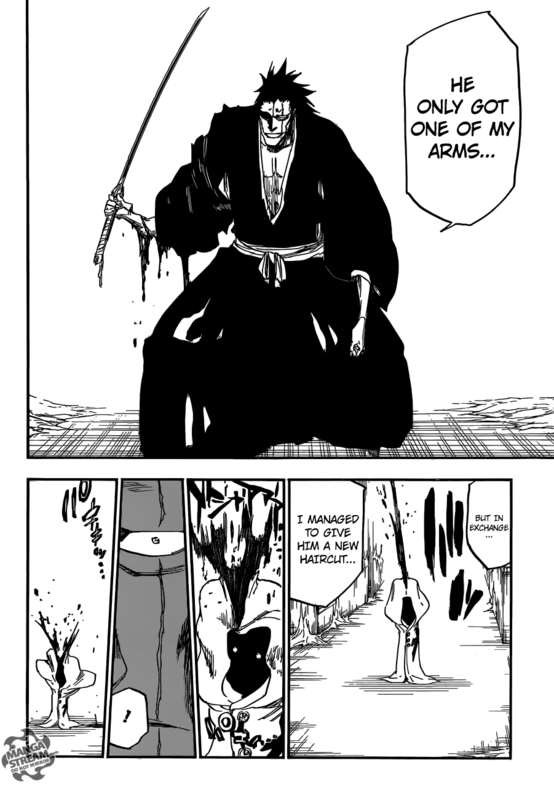 Kenpachi then slashes Pernida its head, while his arm is mangled in return. Pernida’s head begins to change shape. Kenpachi asks “what Pernida could be”, and Mayuri responds “whom Kenpachi is asking”. As One Piece winds down from the Doflamingo fight in to building the World more, Bleach is finally increasing up the action. Sabo leaving wasn’t surprising at all, but I’m a little disappointed that he had to leave. However, I have no doubt that we’ll see him again. There wasn’t really more than that to the chapter. Bleach is setting up the match ups for future battles. Yhwach slaughtering Giselle and Liltotto was completely unsurprising, but I don’t know why they would have bother even trying to kill him. Askin fighting Grimmjow is starting to get annoying, but he doesn’t seem to be a fighting type. He is constantly avoiding confrontation, and I wonder if he will take the fight serious. 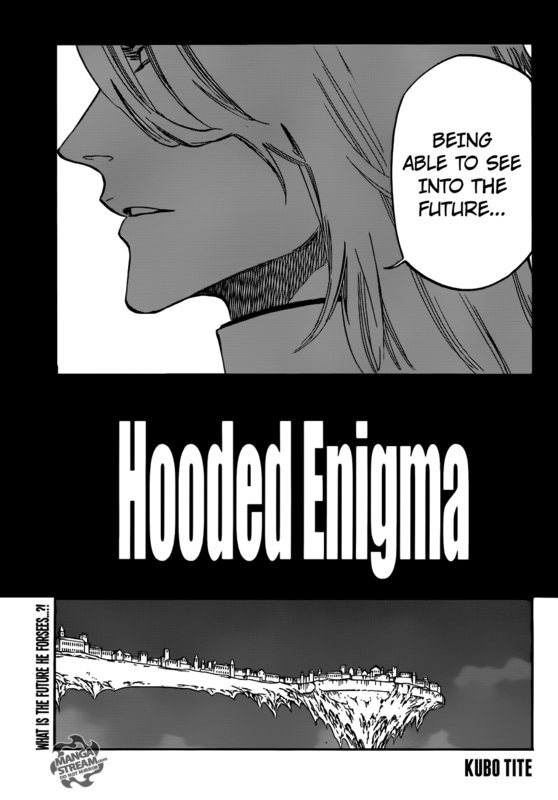 I predicting that Hisagi finally, shows his abilities because he has been under performing in this entire series. Finally, Pernida verses Mayuri and Kenpachi will be epic. I way too hype for that fight.